MINNEAPOLIS/ST. PAUL – The Minnesota Lynx today announced the team’s schedule for the upcoming 2018 season. The Lynx will kick off their historic 20th season in the WNBA at Target Center vs. Los Angeles on Sunday, May 20 at 4:00 p.m. on ESPN2. The 2018 Home Opener presented by Mayo Clinic Sports Medicine will feature a historic ring ceremony and championship banner unveiling for the 2017 WNBA Champions. The 2018 campaign includes 34 regular-season games from May 20 through August 19. Single-game tickets to the Lynx Home Opener presented by Mayo Clinic Sports Medicine are now available by visiting Lynxbasketball.com/tickets or calling 612-673-8400. The Lynx return to Target Center in 2018 after spending the 2017 season at the Xcel Energy Center in St. Paul, due to the major renovation and complete shutdown of Target Center that took place during the summer and early fall of 2017. Minnesota finished the 2017 home slate by going 15-2 and have now won 15 or more home games in five of the last six years. The 2018 campaign includes six nationally broadcast games on ESPN2: May 20 vs. Los Angeles, June 1 vs. Phoenix, July 5 vs. Los Angeles, July 24 vs. New York, Aug. 2 at Los Angeles and Aug. 19 vs. Washington. Minnesota’s 17-game home schedule includes nine weekend games (3 Friday, 1 Saturday, 5 Sunday), five on Tuesday, two on Wednesday and one on Thursday. The team’s annual camp day is Wednesday, July 18 at 12 p.m. when the Lynx host Indiana. The Lynx have one three-game homestand (July 13-18) and two three-game road trips (May 25-29 and June 3-9). The Lynx home half of the schedule is highlighted by visits from their opponent in the last two WNBA Finals, the Los Angeles Sparks, visiting Target Center on Sunday, May 20 and Thursday, July 5. Other notable matchups include Diana Taurasi and the Phoenix Mercury on Friday, June 1 and a rematch of the 2017 WNBA semifinals against the Washington Mystics on Sunday, Aug. 19. For the first time in franchise history, the Lynx will host the WNBA All-Star game on Saturday, July 28 with tip set for 2:30 p.m. CT. Tickets to Verizon WNBA All-Star 2018 will go on sale in spring 2018. Further details on tickets for Lynx season-ticket holders will come at a later date. In the most recent All-Star game in Seattle in 2017, Lynx forward Maya Moore scored 23 points to earn MVP honors for the second straight All-Star contest. Minnesota’s preseason schedule and 2018 local television broadcast schedule will be released at a later date. Following are key facts regarding the Lynx 2018 regular season schedule. The full Lynx regular season schedule is available for download in PDF here. By month, the schedule breaks down as follows: May (2 home, 3 away = 5 total), June (5 home, 5 away = 10 total), July (6 home, 4 away = 10 total), August (4 home, 5 away = 9 total). By day, the schedule breaks down as follows: Monday (0 total), Tuesday (5 home, 2 away = 7 total), Wednesday (2 home, 1 away = 3 total), Thursday (1 home, 3 away = 4 total), Friday (3 home, 4 away = 7 total), Saturday (1 home, 3 away = 4 total), Sunday (5 home, 4 away = 9 total). Minnesota’s home schedule will feature four different starting times: 11 games tip off at 7:00 p.m., four Sunday games will commence at 6:00 p.m., one Wednesday game will start at 12:00 p.m. and the Home Opener on Sunday, May 20 will begin at 4:00 p.m. The Lynx will begin the regular season at home against Los Angeles on Sunday, May 20, the 13th time in franchise history they’ve started at home and fourth consecutive season doing so. For a second consecutive season, Minnesota’s road opener is in New York on Friday, May 25. Minnesota has one three-game homestand: June 13-18 (vs. Las Vegas, Connecticut and Indiana). 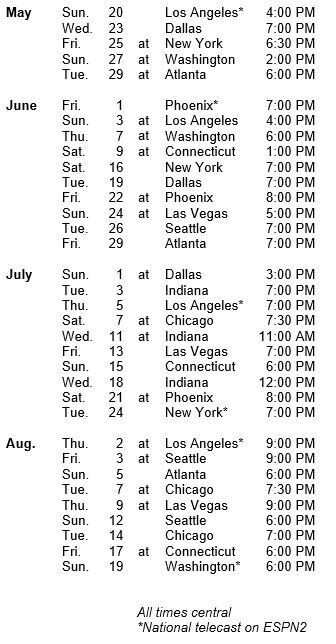 The most home-friendly portion of the Lynx schedule is a 14-game stretch from mid-June to mid-July, when they play nine of 14 games at Target Center (June 16-July 18). The most consecutive road games this season for the Lynx are two strings of three: May 25-29 (at New York, Washington, Atlanta) and June 3-9 (at Los Angeles, Washington and Connecticut). The Lynx also have four stretches of two consecutive road games: June 22-24 (at Phoenix and Las Vegas), July 7-11 (at Chicago and Indiana), Aug. 2-3 (at Los Angeles and Seattle) and Aug. 7-9 (at Chicago and Las Vegas). Minnesota will play one set of games on back-to-back nights this season: Aug. 2-3 (at Los Angeles and Seattle). Dallas (H: 5/23, 6/19; A: 7/1); Las Vegas (H: 7/13; A: 6/24, 8/9); Los Angeles (H: 5/20, 7/5; A: 6/3, 8/2); Phoenix (H: 6/1; A: 6/22, 7/21); Seattle (H: 6/26, 8/12; A: 8/3). Atlanta (H: 6/29, 8/5; A: 5/29); Chicago (H: 8/14; A: 7/7, 8/7); Connecticut (H: 7/15; A: 6/9, 8/17); Indiana (H: 7/3, 7/18; A: 7/11); New York (H: 6/16, 7/24; A: 5/25); Washington (H: 8/19; A: 5/27, 6/7).